Autumn Winter 18 sees modern British heritage brand Belstaff continue its ongoing partnership with cult Japanese street wear label SOPHNET. for the fourth limited edition capsule collection. Belstaff is steeped in its spirit of adventure having created clothing for pioneers in motorsports, aviation and exploration since its birth in 1924. SOPHNET. the popular street-wear brand take inspiration from music, art and street culture adding a different take on the Belstaff collections. The fourth capsule takes influence from the Belstaff Autumn Winter 18 main line collection, ‘Made In UK’ as well English youth subcultures including mods, skin heads, punk and rockers. These inspirations can be seen within the collection through colour, shapes and silhouettes. With a silhouette inspired by military parkas and the iconic Belstaff four-pocket design, the Galston is a lightweight nylon parka making the typically winter style more transeasonal. The Galston features colour blocking at the back with a bold camo inner, adding to the modernity. The Martock Parka takes influence from the mountain jacket and is available in more urban colour ways of black, khaki and navy. Made for cold weather, the lightness of the fabric makes the Martock a versatile parka suitable for everyday use. The camo print lining links direct back to military influence, which was taken from the Belstaff Archive. Made from soft lambskin leather, the Harden jacket is a modern interpretation of the perfecto silhouette used in Belstaff moto heritage. Features include colour blocking under the collar and zip on both sleeves, as well as an asymmetric zip front and multiple pockets. This track jacket and complimenting jersey pants have been updated to a more contemporary silhouette, whilst keeping the retro mood with bright colours and contrasting accesnts. 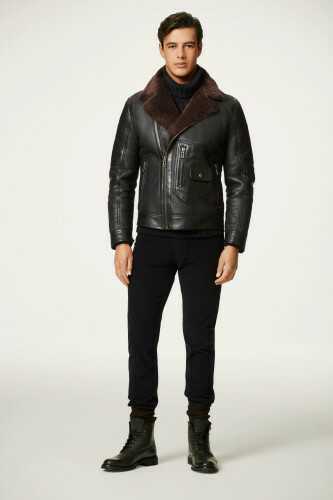 The Belstaff Pheonix is also repeated several times on each sleeve. Continuing the themse of 60s English youth subcultures, the Brownstone top incorporated a bold pattern with bright colours and large Belstaff and SOPHNET. branding on each sleeve, in keeping with modern day street wear. A classic scarf design, available in bold colourways, matching the capsule collection inspirations. The style also takes inspiration from football scarf designs, worn by supporters. The collection is available globally at Belstaff stores, online and with select retail partners from September 18.